Is that a Hybrid Class I spot? Nope, SoA won’t be featuring any hybrid classes or a str/mag split. Can I get a source for this spicy meme? Considering having an AMA of sorts when the SoA FEE3 video goes up over on the SoA tumblr because I want more followers so I’m shilling it because that seems like a better platform for fielding questions for whatever reason. They can probably be asked here but I’ll probably answer them over there. Kind of want to gauge interest beforehand so I’ll know if there’s even enough interest for one, so let me know what you think I guess? here’s hoping nothing is totally broken. I did a dumb and forgot to update the OP. Also fixed some bugs so be sure to redownload and repatch. Oh hey look v1.6 is here. Changelog is in the download, but here it is anyway. Several units have been rebalanced (I can’t remember what changed for who for all the units so #deal). 1-F got a redesign, the NPCs aren’t horribly out of the way now, and enemy unit placement/composition have been redone. The sub bosses in 1-F are more threatening now. 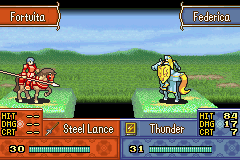 Cavaliers are split into sword/lance/axe. Eagle is now a lance cav. 1-1 has been updated to let Eagle not get fucked by all the fighters that existed originally. Axel comes in with an axereaver as well as his iron lance. Soldiers now gain exp at the same rate as everyone else, so Axel won’t level faster than your other units anymore. 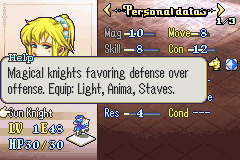 1-8 and onward have more horseslayers now, to threaten units like Eagle and Rika. Some more text has been edited. At least one mug has been updated. In order to experience all the changes, you’ll have to make a new save. You don’t really need to, but I’d do it so you’re getting the new experience or whatever.